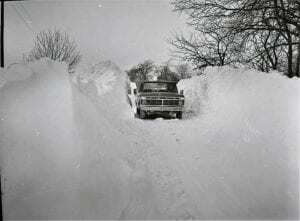 Do you remember “The Blizzard of ’78”? To prepare for the storm’s 40th anniversary next year, The Delaware County Historical Society is assembling material from our archives and holding a public program “The Blizzard of ’78”. Our objective is two-fold: to stimulate our collective memory and gather the community memory. Our hope is to capture a representative sampling of Delaware County’s experience of “The Blizzard of ’78”. Society President, Brent Carson, will present local newspaper accounts and photographs from the Society’s Collection. Brent will share his recollections of the “Record Blizzard” that struck Delaware County in 1978. The storm was so severe that The Delaware Gazette did not publish on Thursday of that week. Following that introduction, Brent will invite attendees to share their recollections of the great storm. Where were you when the storm hit? Were you prepared for the storm? What impact the storm had on you and your family? How did you cope with that the storm? Did the experience of the storm have any lasting effects on you?